I love podcasts, but I do notice that iTunes lacks an easy way to filter between audio and video podcasts in iTunes, particularly when you’re making a smart playlist. 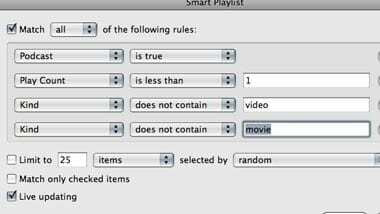 Smart playlists are, obviously, great for setting up a playlist just based on your available, unheard podcasts, but audio and video, they just don’t mix. Voila, you’re good to go. 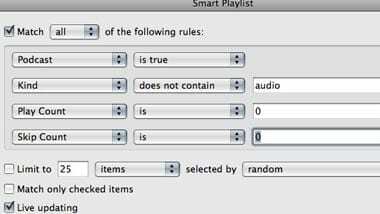 Just click on that Smart Playlist and let it rip. And now for the video aspect. And now you’ve got your own personal TV station, right on your computer. Thanks for the info, I’ve been wondering how to do this, I’ll give it a try when I get home. Menus looks a little different in iTunes 10.4.1.10, but it still works! Thanks a lot!